The Sellers family is heading to Nepal and Tibet for their 2013 expedition with Berg Adventures. 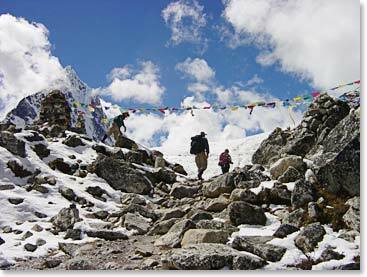 The beginning of our journey will find us walking through one of the most serene areas in the world: the Khumbu Valley. Through colorful villages, to ancient monasteries and beneath the towering peaks of the Himalaya, we will hike to Everest Base Camp at 17,500ft/5,333m. Along our trek to Base Camp we will bask in the fall glow of some of the world’s tallest peaks and climb Kala Patar at 18,300ft/5,580m for unforgettable views of Everest. Following our trek to Base Camp, the adventure continues as we make our attempt for the summit of Island Peak, explore the region of Mustang and travel to Tibet. Stay tuned for daily dispatches from this trip of a lifetime! November 1, 2013 – We Reach the Summit of Kala Patar! October 22, 2013 – The Sellers Family Adventure Begins in Kathmandu!